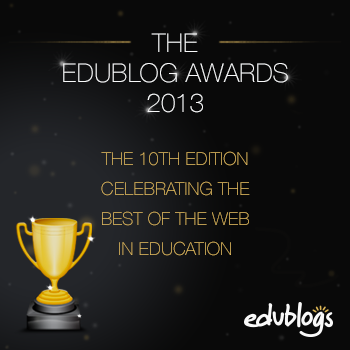 It’s that time of year again and I have a few folks/sites that I would like to consider for this past year’s Edublog Awards. (It’s been ten years of Eddies, apparently). Honestly, the flow of information from my RSS and Twitter and other sites is so fast and furious that I don’t often keep track of where things comes from. But there are always a few sites and folks and blogs and spaces that spring to mind each year. Best Individual Blog: I’ve long been a huge fan of Larry Ferlazzo and his work around collecting and curating information, and this year, he seems to have written more about his classroom and students than other years. Larry’s work around reaching students in a variety of ways — via media and writing and analysis – has really been an inspiring thing to watch. His themes around parent engagement in schools and reaching ELL students in meaningful ways fill a gap in my own reading. Plus, his curation around content from the web is always a relief — that he has done it and not us. Thanks, Larry! Most Influential Post of the Year: When Chris Lehman writes, I read. And his post following the NCTE conference this November was so perfect, capturing both the frustration and the promise of teaching these days. Entitled On Broken Doors and Butter Knives, Lehman reminds us (as he did in a NCTE session) that what we are doing every day has value, and that we need to rely on each other — other educators — for community. Best Twitter Hashtag: I am still excited every morning to see what the #nerdybookclub has up and running, and I just love that there is a group of us teachers who just plain love books that can connect with each other and with authors around the love of books. And then, we bring that passion into our classroom. Best New Blogger: Kim Doullard started up her Thinking Through My Lens to explore photography for a monthly challenge, but her blog and her lens have taken on such interesting angles. Each day, Kim uses her camera to capture a view of the world, and then writes fascinating reflections on what she sees. Plus, she often turns her lens around on her own perceptions of the world and the world of teaching. Best educational use of audio / video / visual / podcast : I have to give a shout-out to the DS106 community, which is difficult to explain in a nomination form. It is a shell of an engaging open digital storytelling course, yet it is not a course at all. And it ain’t a MOOC, either. It’s is pure inspiration around creativity. The great thing is that anyone can get inspired and create with its various elements — including The Daily Create. With video and audio and visual and written suggestions, the DS106 community pushes the boundaries of what is possible in any classroom. Best EdTech/Resource Sharing Blog: Sylvia Tolisano’s Langwitches Blog is a treasure trove of helpful hints, ideas and practical guides to doing things. Plus, it has a cool name. I’ve used her handouts and pointed folks her way on any number of occasions, and always appreciate her thoughtfulness around sharing. Best Teacher Blog: Paul Bogush can be cranky. I suspect he won’t mind being called that. In that cranky blogger way, Paul not only shares out what is going on in his learning spaces — the success and the difficulties — but he is always persistently pushing back against Big Business’s influence in the educational spheres, most notably the Common Core. Paul does his research around policies and then skewers them. In the process, he reminds us teachers to be skeptical and open-minded about the flow of money and influence, and about the spaces where our young students inhabit. Best Individual Tweeter: There are few other folks in my Twitter feed that I look forward to than Chad Sansing. Chad’s insights into the world, and his innovative practice around open technology and learning opportunities, keep me inspired to try new things and to venture forth into the web in new ways. He uses humor and insights, and humility, to extend his ideas to the world. I, for one, am always grateful. Best open PD / unconference / webinar series: I took part in a Make/Hack/Play course through P2PU with Karen Fasimpauer as facilitator. The three week (or so) sessions allows participants a chance to explore the ethos of making and playing but I loved the reflections best of all. The course allows us to move at our own pace, shifting from real space and virtual space, sharing out the ideas that moved into projects. Best group blog: My best group blog is Youth Voices, which is a community of student writers from a variety of schools and global places. I am never surprised by the depth of writing and explorations, but I am always pleased with what comes in via my RSS feed from Youth Voices. It is a powerful network of inquiry, with posts that come from the heart of youth and pop culture and questions that drive curiosity. Lifetime Achievement: When I first started blogging and reading blogs, Wesley Fryer was writing about learning in new ways and sharing out his ideas. He’s still doing it. And I am still learning from him. His footprints are in multiple spaces these days but I always appreciate what Wesley is up to, particularly via his Moving at the Speed of Creativity (and is there a better name for a blogging space? I don’t think so.) Thanks, Wesley, for all that you do to move the world further. I hope my nomination doesn’t make you feel old! This entry was posted in Homepage and tagged #eddies13. Bookmark the permalink. Kevin: what a great start to my Sat. morning, and a reminder to do my Eddies nomination. I particularly smiled when I got to Chad, who manages to convey amazing energy in 140 characters! I’m so lucky to learn from you and him, and the remarkable educators on this list! Thanks, and thanks for stopping by, Lisa. To borrow from Mandela, it’s a privilege to look to and reach for the stars, and a joyful responsibility to be conscience and thankful of those already around us. And back at you, my friend.